According to Jason Jedamski, Director of Student Life Activities, “We had people taking pictures of their family in front of the arch and walking under it just to see it.” This is a common reaction to something so huge (and so very cool!) that is usually followed by lots and lots of posts on social media. It was Landmark Creations’ reputation for producing quality inflatables that brought the high school to us. 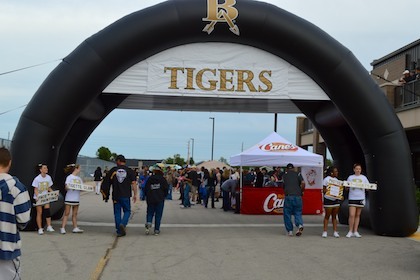 In addition to purchasing this archway, Broken Arrow High also commissioned an inflatable sports tunnel with removable wall. Read that case study here.